Bright, a town in north-east Victoria, is situated in the Ovens Valley, east of Mount Buffalo and north of the Bogong High Plains. It is 210 km from Melbourne and is reached via Wangaratta. Bright was one of the towns in the Ovens gold mining district. Gold was found near the junction of Morses Creek and the Ovens River perhaps as early as 1853 and certainly by 1856. The Morses Creek gold field was the site chosen for a township survey in 1862 and named Bright, most likely after John Bright (1811-89) an English publicist, reformer and parliamentarian. The winning of alluvial gold was followed by the discovery of the Pioneer reef in 1858, and further discoveries came soon afterwards. Mining required capital investment and tradespeople to build water races and to maintain ore crushers. The resulting permanent population formed Bright township. Catholic, Wesleyan and Presbyterian churches were opened during 1860-62 and schools were opened during 1863-65. 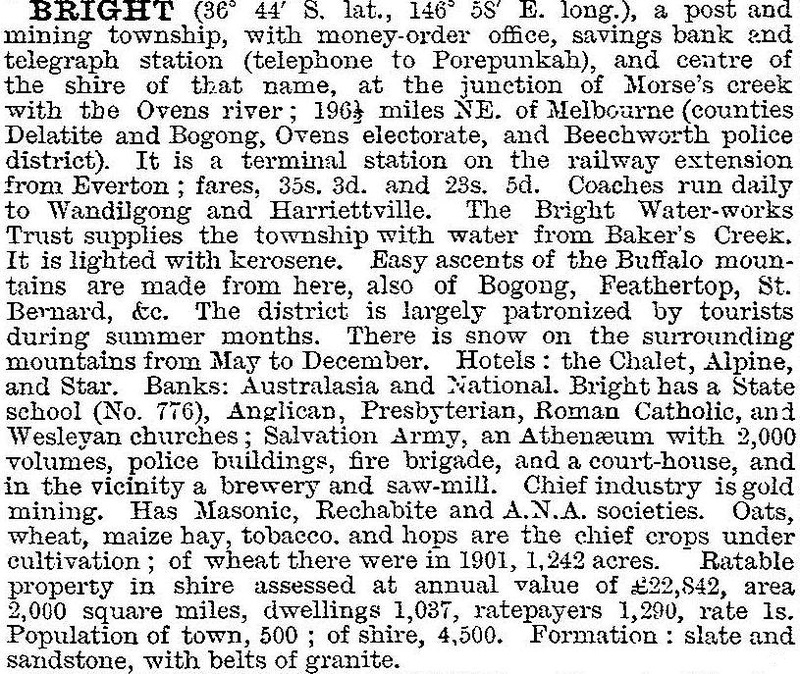 Bailliere's Victorian gazetteer (1865) recorded three hotels, three quartz mills and two bank branches at Bright. It also mentioned the Eurobin waterfall on the nearby Buffalo plateau, a foretaste of Bright's scenic attractions. The 1860s were a fairly prosperous mining period in Bright. Many deep leads were worked, some unsuccessfully, but enough gave rich rewards for a good overall result. Agriculture was mostly confined to dairy farmers and fruit and vegetable growers. During the 1870s Bright's population declined as gold mining, although achieving yields from its ores equal to the previous decade, had a reduced ore body to exploit. There were, however, nascent signs of alpine tourism on the Mount Buffalo plateau. In 1881 a newspaper, the Alpine Observer, began publication, the Bright Alpine club was formed in 1887 and a community library was started in 1889. In the following year Bright was connected by railway to Myrtleford and Wangaratta. The railway, combined with alpine tourism, emerged as a substitute for the declining mining economy. Gold mining had been revived in the early 1900s, some deep leads being exploited but the main activity was bucket dredging. Most dredging was at Porepunkah, where the local entrepreneur Pearson Tewksbury financed the operation. Two dredges at Bright returned over 11,700 ounces of gold until dredging ended in 1922. It gave a stimulus to local industry, an example being Charles Ruwolt's maintenance workshop in Bright. In 1910 a chalet was opened at Mount Buffalo and Bright ran a hire car service for visitors, who often stayed there overnight at a hotel or guesthouse. Dredging, however, left areas of overturned riverbed and sludge. A cure for the unslightly landscape was found in planting, mainly conifers, which later spread into large softwood plantations. Together with the Forest Commission's pine plantations (1927) the Bright progress association and the township community began planting exotic trees partly for landscape improvement and partly to lay the summer dust. The street tree plantings produced extraordinary autumn colours. The Victorian municipal directory (1930) described Bright as a mixed farming township with a tourist progress association and local angling, bowling, racing, tennis and golf clubs. There was also a higher elementary school (1919). In 1932 the Directory added to the description references to tourist houses and a splended camping park. Two years later Bright was described as the Tourism Capital of the Ovens Valley and 'The Ideal Town' winner. Apart from its tree plantings, a particularly obvious piece of evidence of Bright's change was the concrete war memorial clock tower in the town's centre, unveiled at a back-to celebration in 1929. Outside the town the first pine plantations were harvested and a sawmill was opened near the railway goods shed in 1935. There was a steady growth in population, and a bush nursing hospital was opened in 1940. As well as being the local tourism capital, Bright was also the administrative centre of Bright Shire (1866), which included the town of Myrtleford. Since the 1890s the agriculturally better-off Myrtleford had agitated for severance from the shire. The opening of a higher elementary school in Bright in 1919 did not mollify Myrtleford, and during the 1930s Myrtleford's population overtook Bright's. Before and after World War II the population differentials, and contributions to shire rates, grew further apart. In 1960 the Myrtleford district was made a separate shire. About 20 km east of Bright the Mount Beauty township was begun by the State Electricity Commission in 1947. Situated in the Kiewa Valley the township was linked to Falls Creek (c1958) which quickly became a ski resort. The combination of resort destinations was followed by a rapid growth of tourist accommodation in Bright: during 1971-76 the number of holiday accommodation units increased from 13 to 61. The shire engaged an environmental studies team in 1979 which warned that some of Bright's best views could be endangered by inappropriate development. In another report, surveyed residents (many being retirees) felt that tourism had reached saturation point. In fact, the growth spurt soon eased, and the population burst of the 1970s also slowed down. Bright's railway line (1890) closed in 1983 and the station was given over to an historical museum. By then the Autumn festival was a well established holiday period, supplemented by the Bright art competition. The holiday flats, motel units and hotels in Bright Shire comprised 1087 rooms in 1995, and most were in the township. Cabins and campsites numbered 2141 in the shire, mostly out of the town, but there are caravan parks in Bright. The railway line has become a cycling and walking trail. The former court house (1862) and lockup (c1870) are heritage-listed. Bright has a P-12 school (438 pupils, 2014), a hospital (1940), Anglican, Uniting and Catholic churches, a large shopping centre, a tourist information centre, a golf course and a recreation reserve. The Bright Art Gallery received a funding boost in 2012. Bright has the administrative offices of the Alpine Shire, into which Bright Shire was merged in 1994. In 1996 employment in recreation, accommodation and other services in Bright was 24% of total employment. Wholesale and retail trade was 18%. The population profile aged, with residents over 35 years being 45% of the population in 1981 and 55% in 1996. A review of the Bright Hospital facilities, including aged care facilities, began in 2014. Both bushfires and floodwater have threatened Bright, floodwater covering Centenary Park in September 2010.